While brushing my teeth one night, I looked up and saw the toiletry bag that a veteran was using. I swear that I did not doctor this picture in any way. This kid fought in Gaza during Operation Cast Lead, has done tours at Hebron, Jenin, Nablus, the border with Lebanon and Syria, and who knows what else. 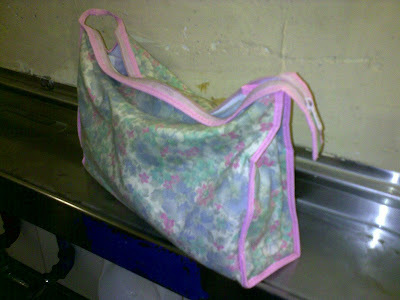 And yet, he has a pink, flowery, grandmother style bag. These are the times that you just smile at the ridiculousness of army life. love you bro! i trust you wouldnt lower yourself to such femininity haha... miss you and be safe!!! Wow that dude is incredibly secure in his masculinity. Hm... makes me wonder if that bag belongs to a girlfriend or something. Hey, I randomly came across your blog tonight. I was pondering what it must be like to live in a country with mandatory service, and how weird it would be to immigrate to Israel as an American and serve in their military. I'm not Jewish nor Israeli so I couldn't do it. Just sort "what if" thinking if that makes any sense. Your blog's been very interesting to me. I served six years in the U.S. Army, as an Arabic linguist. Well, it takes two years to even get through training to get that qualification. I served four years with the 10th Mountain Division. Several differences strike me: first, you guys get to go home more often (obviously YOU don't but still.) We don't get weekend passes until nearly six months in the Army (and even then you can't go more than a couple of hundred miles, which isn't far enough to get home. (Israel is SO much smaller than the U.S.) You get most weekends off after training is complete. And 30 days of leave where you can actually travel away from the base. When you are in Iraq, as I was for one twelve month tour, and one fifteen month tour, you only get two weeks off to go home mid way through. And I once went six months without a single day off from work. Our Basic training was much shorter - even Infantry Basic is only 13 weeks in the Army, about 20 in the Marine Corps. Our Basic training is much stricter. Less downtime, less personal time, the only time for prayers was first half of Sunday (though just like the IDF your choice was between that or cleaning!) And our NCOs are much much older - usually in the their mid thirties. But it's shorter, so I guess it balances out. And we don't do anything like the length of marches you guys do! Those of us who serve in the U.S. military are in it for the long haul. Four years is the normal minimum, though some folks can get a shorter term for Infantry and serve three years instead. And most of your platoon leadership and higher are in it for the full 20 years. I signed on for five years, and got involuntarily extended for another year due to my unit's deployments. At any rate, I wish you all the best. You'll do some time operational. I hope it goes well for you. Just remember to place the needs of the mission first, last, and always - and to remember it's not the ideology that counts, in the end. It's the man on your left and your right. Get those guys, and yourself, home in one piece, and with honor. That is all. That reminds me of Drucksman’s suitcase. Everyone else used the large pack with a strap to take on liberty, Drucksman came with a small suitcase. Everyone ribbed him about it, including his sergeant. I'm moving to israel next week and joining the idf. Do they drug test in the idf?????? and what do they do if they find me positive?????? Please answer me. This is really important!!!! Yeah they do drug tests, if you get tested positive you can forget your pretty career in the IDF. They will send you to do a crappy job for 3 years. You can be a chef in a kitchen, or some warehouse worker in some local small base picking out used gat'kes. You really sound like a guy for the right job. Other side of the medallion will be that you will never have to do "30" days on base because of jobnik status. Well maybe in jail, if you get caught with bud on base. Maybe you should cancel your ticket because we have enough goofs allready. what an idiot... please don't join the IDF if that is your goal, smoking bud. ur gonna get someone killed you loser! Amnon - I gotta say, if you even think you'd have the free time to find someone on base to sell hash to you, you're mistaken. I don't think you even realize what kind of commitment the army is. Ruanne - Thanks a lot for your comment. very interesting stuff. I told lots of my fellow soldiers about your extra year. Stop-Loss, I'm assuming? One kid actually saw the movie and recognized the situation. I would like to clarify a couple things though. As you said, Israel is very small. It is about the same size as New Jersey, but still even smaller. And in terms of people getting to go home for weekends (depends on what you're doing in the army, of course, for how often you get out), that is just one aspect of a compulsory army. These kids are 18 and are forced, no way around that word, to join the service. They live generally no more than a 2 hour ride from the base, with many living much closer. It would be unthinkable that they are both forced to join and then not allowed to get a day off here and there! Secondly, again depending on units, you don't get most weekends off after training. I am currently getting EVERY weekend off, but that's a 6 week deal, and will end very soon. I am generally at my home for about 4 days out of the month. We kinda close/go home a little less than 50/50. You being in Iraq for 15 months and getting 2 weeks stateside... that's torture, my friend. Oh, thirdly, we get a little more than $100 a month. Think about that. Very dangerous work for $100 a month. Compulsory armies are very different from volunteer ones. Basic: Our basic is about 4 months, at least for infantry (I know tanks is much shorter now, recently). During this period, you have 0 free time. You get 1 hour before bed to shower and organize your life, but that's it. No breaks during the day. If you get a 5 minute break, that's a gift. The smokers literally wouldn't get to smoke until that hour at night. Now, I have read that US Army basic, or the military there in general, is pretty damn strict. For example, you go to the base and they take all your personal effects - no phone, no tobacco, no civ clothes, nothing. Ours is not like that, we can have anything we want in our rooms. Again, this is a compulsory army in a country weary of all this stuff. We have a high level of discipline, very strict rules and all that, no free time, none of that - but again, we sometimes say when the commanders get a little overzealous, "He thinks he's in the American army or something." So, I respect your basic, but don't think we're drinking coffee and playing video games all day! It's hard work. Anyway, Ruanne, thank you very much for your comment. I did enjoy it. Give me some more info! We can swap stories or something like that. Stop Loss indeed. It's being phased out, and of course all American soldiers are volunteers in the first place. But still, they are asking a lot of us since 2003 or so. Many of my senior sergeants have already spent a little over three years in Iraq, and my unit (you will still think of it as your unit even after you are a Reservist, trust me!) is going back AGAIN for another year sometime this winter. At any rate, it's nice to be a civilian again, though adjustment's not been automatic or easy. As you point out, you can be a lot stricter with volunteers, since you can send them home if they absolutely can't/won't adjust (not common but it happens, 10% of soldiers don't make it through initial training - this statistic is very approximate.) With mandatory service, all you can do is shift people around, since they have to serve out their time anyways. I hope y'all ARE drinking coffee and playing video games - you need a break sometimes. Lord knows Ops are not even possible without coffee. In fact, lots of guys DID play Halo, with the screen projected on the wall of a nearby building when I was in Iraq! It was funny, because you had to duck THROUGH their game to get by, and I'd always be like "Ceasefire! Friendly crossing!"